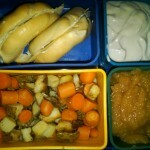 Turkey Bagelwich, Homemade Applesauce, Potatoes mixed with boiled carrots, and to top it all off some lemon soy yogurt. Delicious. To drink today some rice dream rice milk. If you’d like to know more about the lunchboxes featured in these pictures and posts, then you should take a look at PlanetBox Lunchboxes.